Another piece of Kandy on the shelves? Yes, if your teeth aren’t already rotten from the many Kandy treats from Roksan by now then read on. Maybe the Roksan Sweet Shop have changed the flavour this time around and maybe they have put a cherry on top. Or maybe they may have just changed the wrapper slightly? Certainly the wrapper does look different on the new £1250 K3. The overall build quality is extremely nice and attracts the eye further with a new range of stylish colour options. Anthracite, Charcoal and Opium are the new blacks and the shades are very appealing indeed and rather make a design statement. 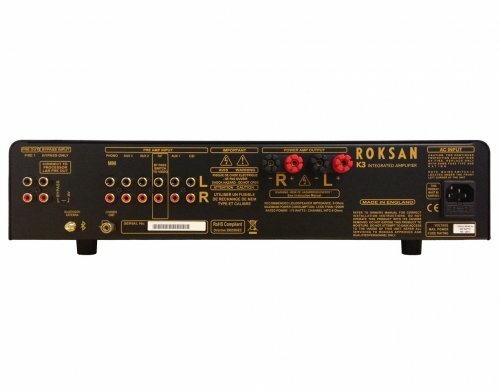 The feature rich amplifier provides connections for both RCA Unbalanced, Moving Magnet and Bluetooth inputs as well as RCA preamp outputs to connect to a power amplifier such as Roksan’s own Kandy Power Amplifier. The K3 will put out 140w into 8ohms and 220w into 4ohms. Remember the K2 BT? Well the BT stood for Bluetooth, Roksan haven’t simply put a new wrapper on their latest offering from the Kandy range, they deem Bluetooth as a critical connection for the modern day consumer so without making a fuss about it, it’s just there. 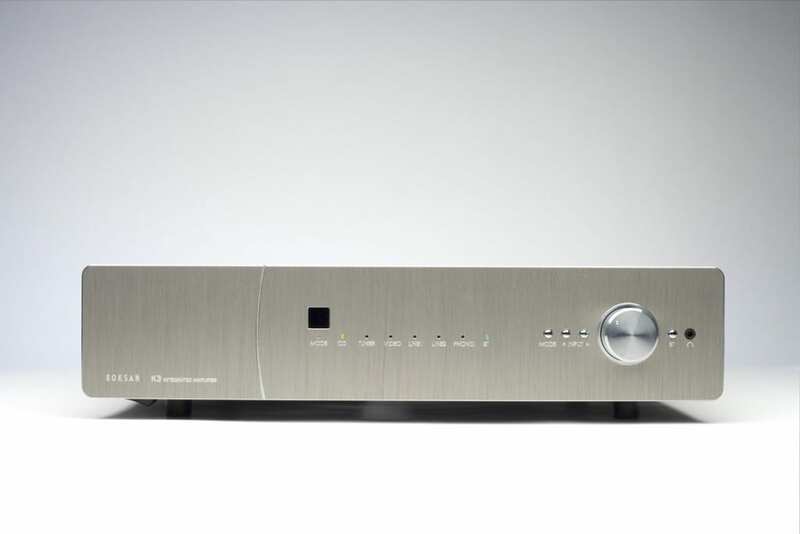 The K3 has other performance benefits such as its larger toroidal transformer alongside the power supply circuitry and a shorter signal path laid out with great spec components to, on paper at least provide substantial upgrades in resolution, bass stability and overall a better controlled sound with finer details. I know what to expect when I fire a Kandy up, over the years there have been several improvements to the range, but I’ve never really aligned the Kandy completely with other Roksan products. It certainly no doubt does a remarkable job of producing party like music, but when it came to the subtleties I’ve always been found wanting more. Now in its 32nd guise (only kidding guys!) the Kandy K3 for me finally sounds like a ‘Baby Caspian’ a sound which I would have expected from the Kandy range when I first heard it years ago after owning one of the first model Caspians. The level of insight and realism has gained dramatically over the K2 and the level of refinement and sophistication has took on a new guise. There has been an uncanny reoccurring feeling with Roksan gear of late that I have heard and that is there just seems to be a new development in their overall sound signature. I especially would like to point toward the ability of the treble. 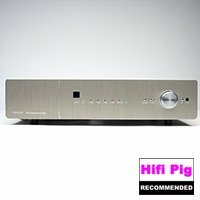 I remarked in the Darius S1 review and have likened one or two other products since by gauging them against the S1’s upper frequencies, that Roksan seem to have addressed the area of bandwidth with a cleverness of attention, not attenuated but more refined, relaxed and confident in presentation. Whilst listening to Derrin Nuendorf I was dumbfounded at how much better string rendition, clarity and raw presence the K3 had over the K2, which if you read my review would remember that I had to play extensively with cables to get the amp sounding at its best and concluded the review by stating that it was a party amp that could excite rather than give an accurate display of instrument timbre and tonality. Well, the K3, or the Baby Caspian as I now see it has come an awful long way since then, but does it still possess its power and ability to slam dynamically, fill the room with harmonic rushes of electro synthesised sound and Rock out? First track of choice was a poppy dance number ‘Stolen Dance’ by Milky Chance. After the first few hi hat beats the room floods with that encapsulating sound that the studio dance track produces, along with its strong bass the K3 gives an upfront midrange with layering to the width of the soundstage which is pretty damn convincing and unexpected of an amp in this class. I’m sat here a little confused now, I had my initial listening with acoustic music as that’s what was on the playlist, diverted to see if the Kandy was still in the heart of the beast and in all honesty expected dance music especially to be much different than the K2; but no, the amplifiers other personality came out and just laughed as I was sat on the sofa with a somewhat puzzled look on my face. ‘Sunchyme’ by Dario G (Sash remix) came on whilst I was thinking what to write next and that was it, I was off. Volume up, bouncing around the lounge with the steel drums filling my entire room and no doubt the neighbours kids dancing along. A noticeable step up in performance has got to be the bass, it’s larger, taughter and punchier. This is down to the larger toroid in the power supply and the K3 knocks out beats with more command and dynamism. I’m not going to babble on about the characteristics of the Kandy’s up-beat fun party nature, except to say take a K2 give it a stiff drink and wait till it lets it’s hair down! After I wore a hole in my socks cleaning the rug wishing I had a couple of 18 inchers and some horns it was time to calm down and take a breather (must check the ingredients on that orange juice…). It was time after my party for me to see if I was still as convinced with K3 with instruments. Ed Sheeran seemed to agree that ‘Baby Caspian’ was back in the room, but after more listening we decided there to be a clear difference between my fond memories of the Caspian and the K3 – a difference in bass presentation, the K3 was more start stop whereas the the Caspian was more fluid and extended, but the rest of the presentation could for sure pass for a slimmed down, condensed little brother. There’s definite form to be admired in the K3’s abilities to reproduce acoustic and instrumental pieces over the previous models, moving it more towards the all round status. I can imagine people using the Kandy now for weekend get together so at home as well as a nice relaxing listen after a hard day… which personally I don’t feel the older models came close to achieving. Moving on from the K2 BT (Bluetooth) the K3 doesn’t have the designation in its title although has the technology as standard under the hood. The Apt-X force is strong in this one. Fighting over what they are going to play next was a group of friends who came over for a few drinks at the weekend. Fortunately they had different playlists and after restoring order and coming to some sort of concencous of what we would like to play and also creating a new playlist of tracks – at one stage by bluetoothing individual songs to one phone and using that as the streamer – we all enjoyed our evening with a range of music being played easily and surprising well versed. Sound quality is a shade off a hard wired link and our range of lossless and MP3 files did vary, but the convenience and ability to get everyone involved was fun. To sum up my time with the Roksan Kandy K3 I can say that further progress had been made to bring the amplifier closer to an amp that can be stated as a ‘good all rounder’. It’s flexibility to play a wider variety of genres than previous incarnations is a much welcomed benefit and Roksn have once applied a good ear to tuning the top end to reflect what I believe to be a stand out point of the new generation of Roksan products. The K3 doesn’t quite have the sophistication of the Caspian and doesn’t deliver the refinement in the midrange that the Caspian can achieve but it does a great job for its respective price and I stand by my ‘Baby Caspian’ label, but would definitely prefix it with the word ‘spicy’ as the fun that can be had with the sound is something that could well stand it apart from the rest in its peer group. I did go backwards and forwards a little bit I know but that’s how the progression of this review panned out and that’s what conclusions are for after all. It is a little edgy sometimes yes, it is a little forward and lively yes, but let’s face it, if it wasn’t it wouldn’t be a Kandy!